We spent a wonderful Memorial Day weekend in Praha; Prague, Czech Republic. With a myriad of towers, steeples, domes, spires, battlements and bridges of numerous architectural styles, medieval, Renaissance, Baroque, etc., the city has a magical and unique appearance. The turn of every corner on its narrow, winding streets results in another breathtaking image. Of course, after a world war, a world wide depression, another world war and decades of communist rule there are still a good number of buildings in Prague that are rundown and shabby but, in spite of that, Prague turned out to be a very special destination. Because of its central location in Europe, Prague has played a pivotal role during its a 1100 year history. It has been the residence of two Holy Roman Emperors. The people of Prague precipitated the Thirty Year’s War (1618-1648) during a defenestration when Protestants threw Catholics out the third floor windows of the Prague Castle. For a significant period of its history, Prague was oppressively dominated by German influences in the form of Habsburg or Prussian forces to the point of Czech customs and language being declared unlawful. After WW I and the creation of Czechoslovakia, Prague became the new country’s capitol. Occupied again by the Germans in WW II, after the war, Prague and Czechoslovakia remained under communist control until the demise of the Soviet Union. After Czechoslovakia split in 1993 Prague became the capital again of a new county, the Czech Republic. The following pictures are a look at the images and experiences of our trip to Praha. Most of the information about Prague came from our excellent city tour guide. 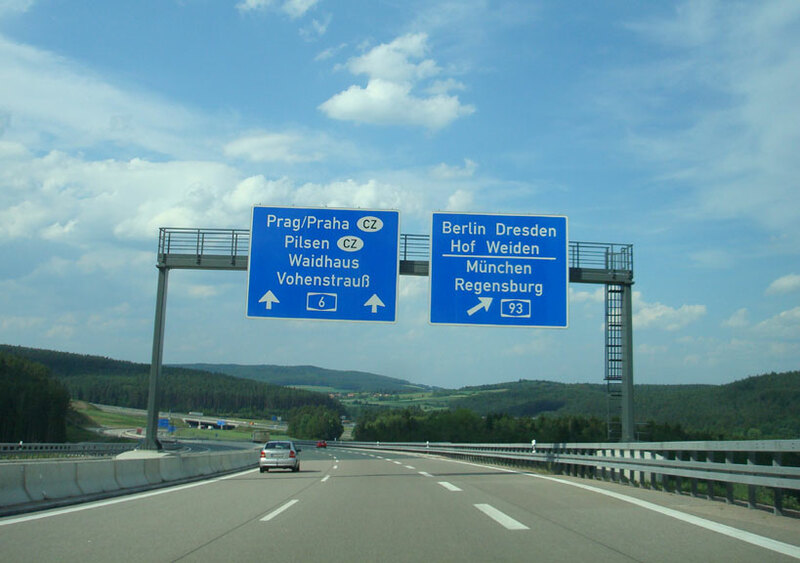 Nearing the Czech Republic border. Pretty cool autobahn intersection. From here you can go to Prague, Berlin or Munich. After our arrival and hotel check-in, we needed some sustenance and here’s our first stop. U Medvidku, a very popular beer hall/restaurant/hotel. U Medvidku has a very typical history which dates back to 1466. After WW II the property was confiscated without compensation by the socialist Czechoslovakian government. The property greatly deteriorated until the inheritors of the original owners regained control of the business in the 1989 and were able to renovate the building. Today it’s a great place with many connecting rooms, the city’s smallest brewery, great food and beer. U Medvidku serves Budweiser Budvar (the Czech Budweiser). These half-liter mugs cost 35 Koruna, about $2. Awesome price for quality beer. U Medvidku also serves their own beer, XBEER 33, produced in their little brewery, which they claim to be the world’s strongest beer with a 12.9% alcohol content. Our next stop was U Vejvodu, another great, unique beer hall. U Medvidku serves Pilsner Urquell. Before we went to the hotel we walked to the river to see the Prague Castle at night. Here we’re on the east bank of the Vitava River. Throughout Europe, it’s common to see these concrete bumpers on the corners of buildings at the entrance to a narrow alleyway. These concrete bumpers are to protect the building from vehicles as they turn into the alley. Here, during the communist control of Prague, someone got a bit inventive and decided to enhance their concrete bumper to make a statement. Jeff helps to illustrate the basic theme. On the Charles Bridge, looking west toward the Prague Castle and the part of Prague known as Mala Strana, Lesser Town. The Charles Bridge was begun in 1347 by the Charles IV, King of Bohemia and Holy Roman Emperor. The bridge would not be completed until the early 1400s and would remain the only bridge across the Vitava in Prague until 1841. On the Charles Bridge looking back toward Stare Mesto, Old Town, and the Old Town Bridge Tower. One of the 30 statues that sit on the balustrade of Charles Bridge. These statues were placed on the bridge in the late 1600s and early 1700s. They are statues of various saints and patron saints that were created by some of the most prominent Bohemian sculptors of the day. In 1965 the city began replacing the original statues with replicas. The originals are now exhibited in the National Museum. The west side of the Charles Bridge and the Lesser Town Bridge Tower. The largest and most expensive statue on Charles Bridge. The statues of St. John of Matha and Felix of Valois who were members of an order that bought back Christians who were in the captivity of Turks. The base shows three Christians chained in a cave praying to God for salvation. Our city tour of Prague was on Segways; really great fun and a wonderful learning experience. Our first stop was the John Lennon Wall. John Lennon never visited Prague but upon his death, communist oppressed people of Prague came to this wall and painted graffiti wishes and comments about Lennon. Socialist police would paint over the wall each day until that chore became too tedious. Because the wall is directly across the street from the French Embassy, police chose not to pursue these graffiti artists and possibly have their strong arm tactics shown to the world. New graffiti appears almost daily even now with the overall look of the wall completely changed every few weeks. Down at Vitava River level looking at the Charles Bridge. Prague had an extreme flood in 2002. At our present spot we would have been about 12 feet under water. Baby statues created by David Cerny, a prominent Czech sculptor. These statues have no face, just a bar code. You figure it out. Philip, our guide telling me about the history of the Prague National Theater there in the background. The theater is a national monument and a source of great pride. It was one of the first places that was allowed to accomplish performances in the Czech language and is seen as an important instrument in saving Czech culture and heritage. It originally opened in 1881 but shortly after the first performance was destroyed in a fire; a national catastrophe. Reconstruction of the present building began almost immediately. An interesting building in Prague. Look at the top floor windows. The paint trim spells PRAHA. Prague’s New Town or Winceslaus Square. The National Museum at the far end. Powder Gate, one of the four remaining gates of the city wall. Named such because it was the storage point for the city’s supply of gun powder. One of the many concert halls where Mozart performed in Prague. After Mozart fell from favor in Salzburg and Vienna he was still welcomed warmly in Prague where he would live for months at a time and performed repeatedly. Don Giovanni seems to be playing everywhere even today. Charles University, founded in 1348, is one of the oldest universities in Europe. Arriving in the Old Town square, the St. Nicholas Church. The Old Town Hall clock tower and the double spired Tyn Cathedral. The Astronomical Clock on the side of the Old Town Hall. The clock was originally built in 1410 and is the only such working clock in the world. It has a number of dials or rings that show present and Old Prague time, zodiac signs, position of the sun and the moon. 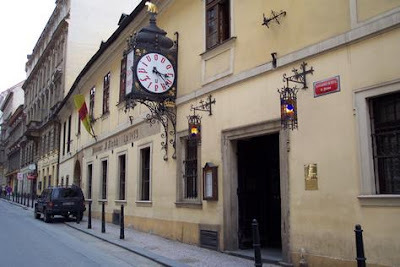 A number of years ago the clock keeper asked Prague for a pay raise and was told no by the city. So he retired. However, because of the complexity of the clock no adequate replacement could be found. The solution, hire the old clock keeper back at three times his previous pay. He’s getting ready to retire again but now has trained his replacements. In the old Jewish part of Prague, known as Josefov, is the oldest active synagogue in Europe, the Old New Synagogue; completed in 1217. Until the mid-1700s the Jews of Prague were required to live in the Josefov ghetto area. When they died, they had to be buried in the small cemetery there. Over time, it’s believed that over 100,000 people were buried in this small plot of land and ,because space was so limited, bodies had to be buried one of top of another to the extent of 12 bodies deep. Crossing back over the Vitava River to start our ride up to the Prague Castle. The streets up to the Prague Castle are quite steep and cobbled stone so it made for an interesting ride on the Segway. We made it. The large courtyard in front of the Prague Castle. The entry gate to the Prague Castle is a little intimidating. Those statues sort of indicate that if you misbehave in the castle, they’ll beat the crap out of you. Jeff and I on our Segways, high above Prague. Prague Castle with St. Vitus Cathedral. Prague Castle is the largest castle in the world. St. Vitus is situated entirely within the walls of the castle. While we were on our Segway tour our tour guide told us that there’s a tradition in Prague that says upon your first visit to the city, your one wish will be granted if you touch a specific spot on the Charles Bridge. He told us there’s a misconception that that point is one of the scenes at the base of the statue of St. John of Nepomuk. St. John was a priest who had taken the confession of the queen in 1393. The king wanted to know what she had confessed. When St. John refused to divulge that information the kings troops threw him from the Charles Bridge into the river where he drowned. (Apparently folks from Prague are fond of throwing others from high places, like windows and bridges.) Although it’s quite obvious where people have placed their hands at the base of the St. John statue, again, our tour guide said this is not the place to make your wish. Here’s one of the scenes at the base of St. John of Nepomuk. It shows him being thrown from the Charles Bridge. According to our guide, this is not the place to make your wish. A bit further east along the north side of the Charles Bridge is this plaque, also a commemoration of St. John of Nepomuk. Among the cobblestones in front of the plaque is a bronze disc. According to our guide, to have your wish granted, it must be your first trip to Prague, place your hand on the plaque while stepping on the bronze disc. With that, Jeff says he’s getting a Porsche 911. Well, after that three-hour city Segway tour and all that intense wishing, we needed sustenance once again. Oh yeah, and Jeff wanted to celebrate his future Porsche 911. So we went to U Fleku, a wonderful beer hall in the Old Town. U Fleku is one of the oldest pubs in Prague, founded in 1499. It can seat 1200 in its eight rooms. While we were here we sat next to and talked with two couples from Poland and after they left, two couples from Holland. Great, fun conversation!! U Fleku serves its own dark beer, Flekovsky Tmavy Lezak (The Flek Dark Double Lager) which is available no where else on earth. It was cold, smooth and light. One of the best things about the service at U Fleku was that a waiter came out with a tray full of beers and if you didn’t already have one, or your’s was almost empty, he just put a beer in front of you. It was pretty much perpetual beer. Here’s a video we took in U Fleku. The accordion was playing, the beer was flowing, we were having a great time. Towards the end of the video you can see a guy carrying around a tray of shot glasses. These were filled with some type of local fire water. In the picture above you can see our empty glasses; good stuff but one was enough. The food was great at U Fleku too. I had a marinated pork cutlet plate with red cabbage and Jeff had sausages, sauerkraut and baked potatoes. Yummy! Next we walked down to see one of the quirkier sights in Prague. The Dancing House. This building was built in 1996. Other nicknames of the building were the Fred and Ginger house because it sort of looks like a couple dancing and the Drunk House. Then we walked along the river and back into Old Town to visit U Zlateho tygra, the Golden Tiger. One of the unique things about this pub is that every seat in the beer hall is reserved for locals. It’s fine to sit at the tables here but once a local shows up and asks for their spot, it’s time for you to leave. I asked these Czech gentlemen if we could sit with them and they seemed delighted to have our company; and the stories began. According to them, when Bill Clinton and Vaclav Havel shared a beer here, Madeleine Albright and Colin Powell sat at the very table where we were now. Eventually the table was completely full with locals and although another tourist couple was asked to leave, Jeff and I were allowed to stay. Again, the conversation was fantastic!!!! An interesting sight was to watch when one of the folks on the far side of the table needed to go to the toilet. When they departed or returned, all the people around the table stood and lifted the table up so that person could exit or return under the table. U Zlateho tygra serves unpasteurized Pilsner Urquell. That means no preservatives and that the beer temperature has never been elevated to eliminate micro-organisms which also can eliminate certain beer flavors and tastes. THIS WAS A WONDERFUL BEER!! The cranium on the beer was thick and creamy and the beer cold and extraordinarily tasty!! The inside of the U Zlateho tygra. Walking up the street to eat we spotted this bit of Czech art. It’s a statue of a guy hanging by one hand. It’s the creation of the same guy, David Cerny, that did the big babies. Our meal for the evening, this huge pork knuckle on our own personal spit. Excellent!! And with that, the day was over and what a day it was. Awesome!! Our third day in Prague we wandered over to the Old Town square which was very busy with various activities. This videos shows a Czech dancing groups putting on a display of their skills at the foot of the Tyn Cathedral. We’re at U Pinkasu, the very first pub in Prague to serve Pilsner Urquell back in 1843. Pilsner Urquell, the very first pilsner beer, was first brewed in 1842 so these guys were really on the ball. U Pinkasu also serves unpasteurized Pilsner Urquell. Pilsner Urquell is actually German for the beer that is known as Plzensky Prazdroj. Urquell and Prazdroj both mean “original” in their respective language, while Pilsner and Plzensky mean from Plzen, a city just west of Prague. The beer garden at U Pinkasu was quite interesting. They built it between the back of their building and the exterior wall of a next door church. Must not be a Baptist church. They don't like beer that close. Now we’re up in Letenske Sady, a large park north of the Old Town area of the city. This is a huge metronome built high on this platform. What made this interesting to us is what was originally placed on this massive concrete pedestal. 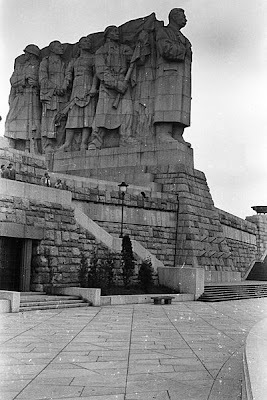 This is an old picture of the original structure that stood on this pedestal, a huge statue honoring Joseph Stalin. The people of Prague never wanted this monument. The Soviets forced a local sculptor to create this piece of “art.” He received considerable hate mail for his efforts and committed suicide just weeks after his creation was dedicated in 1955. The Stalin monument was torn down in 1962. The metronome sculpture was built on the sight in 1991. Stalin to Hooters. Yes, they have one in Prague. Damn, globalization. I guess we won. An interesting aspect of addresses in Prague. Each building has two numbers associated with its location. One is the street address and the second is the building number. Here’s a picture of the door to the parking area at our hotel, The Red Chair. On the left, in blue, is the street address number, 4. On the right, in red, is the building number, 250. To get a map of our hotel location we had put the street address into Google Earth; Liliova 4, Prague, Czech Republic. What Google Earth displayed was Liliova 250/4, 11000 Praha-Stare Mesto, Czech Republic. We wondered what the 250 was about. Our Segway guide answered that question. Every building in Prague has a building number assigned to it, so in this case, our hotel is in Stare Mesto (Old Town), building 250. Simple. A few stowaways we found in our car when we got home. Very strange, 13 different Czech beers. We told them they'd be safe with us. Kind of like Hansel and Gretel and the witch. Prague was awesome and great fun! !